Back in the US, Saturday mornings often included some recreational soccer matches. Our children miss playing organized sports, but they have enjoyed having kids around all the time to play soccer or basketball in the afternoons or on weekends. Recently an actual soccer match was scheduled here at GSF. There is another organization in Jinja that works with street kids. They have put together a soccer team and challenged us to a match. I believe this may be an anual event, but since we lived in Jinja for several months, we missed out on it last year. The kids here at Good Shepherd's Fold had been practicing for a week or so in preparation for this match. But when the other team arrived, it was clear that they have been playing together for quite some time. Their team played really well together! 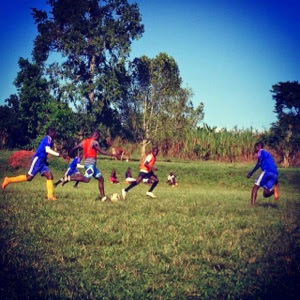 Our kids gave a good effort, but were not quite as experienced as the team from Jinja. Here is a photo another missionary took from the match. Our kids didn't play much because most of the kids on the other team were much older and bigger. Our kids were a bit disappointed, but we have been discussing if there might be other ways to provide opportunities for some more organized soccer matches. We certainly have enough kids around who love to play. David and I both enjoy coaching, and there are other missionaries on campus who also have soccer experience. We also recently received several volleyballs in the mail, and I am excited about the opportunity to do some more volleyball coaching with the missionary kids, the GSF kids and the students at the Ugandan school. There are so many different opportunities to minister here. Just through sports alone we could fill every spare moment building relationships with kids and helping them develop skills. With so many kids, and so many needs, it is often hard for me to know how to best invest my time. Our primary calling here is teaching the missionary kids. We are really enjoying that opportunity to use our gifts and experience to help the families here in that way. But each day other opportunities arise. Opportunities to hug toddlers and talk with them about the love of Jesus. Opportunities to pray with teenagers over relationship struggles. Opportunities to learn Luganda so that I can better communicate with friends in the village. Opportunities to talk with the fatherless about the perfect love of their heavenly father. Opportunities to provide for the education of children who cannot afford school fees. Opportunities to help my own children grow in compassion as the see the needs of those around them. Opportunities to invite neighbors in the village to come to church. The opportunities abound. Each day I wonder what new opportunities God will bring our way. I am praying for wisdom to know what things he is calling us to do, and what things are just my own ideas. It is easy to get overwhelmed if I think it is up to me to meet all of the needs of those around me. Thankfully it is not. God is in control. I am slowly learning to trust Him to guide my steps, trusting that He has the big picture in mind. It is easy for me to begin thinking that every opportunity is a calling. It is also easy to get so busy with life that I fail to see the opportunities God brings. It is my prayer that God will open my eyes to see what he has called me to do each day. These verses from Ephesians 5 have been an encouragement to me. 2 And walk in love, as Christ loved us and gave himself up for us, a fragrant offering and sacrifice to God. 15 Look carefully then how you walk, not as unwise but as wise, 16 making the best use of the time, because the days are evil. 17 Therefore do not be foolish, but understand what the will of the Lord is. I can only walk in love and make the most of the opportunities before me as I remember the amazing love God has shown me in Jesus. He gave himself up for me and you. His love makes it a joy to share that love with those around. I pray that you also will know, rejoice, and rest in His love as you seek to make the most of the opportunities He has given you today.